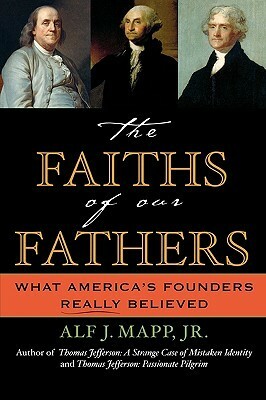 The Faiths of Our Fathers: What America's Founders Really Believed by Alf J. Mapp Jr.
We’d love your help. Let us know what’s wrong with this preview of The Faiths of Our Fathers by Alf J. Mapp Jr.. Preview — The Faiths of Our Fathers by Alf J. Mapp Jr.
To ask other readers questions about The Faiths of Our Fathers, please sign up. To his credit, the author does a good job of showing how many of the founding fathers had grown up in a system where there was in fact a state religion, and how that had led to the persecution of those of other faiths. Of particular note are several mentions of how Baptists suffered under the Anglican state religion, and how they were strong supporters of the separation of church and state, going so far as to reject offers of state sponsorship from those who sought to retain a link between churc To his credit, the author does a good job of showing how many of the founding fathers had grown up in a system where there was in fact a state religion, and how that had led to the persecution of those of other faiths. Of particular note are several mentions of how Baptists suffered under the Anglican state religion, and how they were strong supporters of the separation of church and state, going so far as to reject offers of state sponsorship from those who sought to retain a link between church and state, finding it preferable that separation be achieved than that they should join the ranks of state sponsored religions. The author also shows that the founding fathers were not united in faith, and that in at least some cases it was their very faith that drove them to strive for separation of church and state, but seems strangely determined to minimize the role of Deism amongst the founding fathers. To start with, his attempts to show that Jefferson and Washington were not Deists seem to me rather weak, but more importantly is the omission of any who were unambiguously Deist. Thomas Paine gets only a passing mention. A book that was truly interested in canvassing the beliefs of the founding fathers certainly should have devoted more attention to this outspoken Deist and critic of Christianity, even if only to show how unusual some of his beliefs were. I really like the idea of this book. The religion of our Founding Fathers has been a constant debate since they signed the Declaration of Independence. Some believe they were devout Christians who designed our nation to follow Judeo-Christian values. Others hold that they were mostly deists who valued ethics over a closely followed faith. The truth is, the founders represented a wide spectrum of religious faith. But this debate rages on and nearly 250 years later, we still argue over religion's I really like the idea of this book. The religion of our Founding Fathers has been a constant debate since they signed the Declaration of Independence. Some believe they were devout Christians who designed our nation to follow Judeo-Christian values. Others hold that they were mostly deists who valued ethics over a closely followed faith. The truth is, the founders represented a wide spectrum of religious faith. But this debate rages on and nearly 250 years later, we still argue over religion's proper role in Government. Unfortunately, this book fails to deliver on my expectations. It suffers from an identity crisis. It is split into short discussions on 11 of the Founding Fathers. I'm those chapters, we get part religion, part biography, and part history. I think a large part of that is due to the author's choice in subjects. Men like Jefferson, Washington, and Adams are well known. Readers don't need a review of their actions. So Mapp was able to focus on their respective religious faiths. And that is what I expected from a book entitled The Faith of our Fathers. But others, like Haym Salomon and Charles Carroll, are unknown to all but the most serious students of the revolution. Rather than devote the pages to their faith, Mapp provides essentially an abridged biography of each. Their religion is almost ignored. At one point, Mapp literally writes "we know tantalizingly little about Salomon's personal faith." If we don't know about his faith, why even include him in a book about the faith of our founders? There was already a plethora of religious sects, cults, and mainstream denominations, but religious practice was rather different than much of what we see today. The Founders were a diverse group, but all a product of the norm of the times, i.e. state sponsored religion. Each of the colonies was formed around one primary Christian denomination with varying degrees of acceptance or tolerance of others, but to me it speaks volumes that this practice was not enshrined in the Constitution. The fact that many of the Founders also avoided taking Communion and being Confirmed suggests that they had Deistic leanings informed by Enlightenment philosophies and values. While no author is completely free of bias, Alf Mapp's leanings are unapologetically clear. In most cases, his conclusions are supported by valid but carefully selected snippets of correspondence, journals and speeches. In other instances, his essay on Benjamin Franklin for example, the database is more vague. I also found it oddly convenient that the author elected to include rather obscure statesmen like Haym Salomon and Charles Carroll and ignored the likes of Thomas Paine and Ethan Allen. On While no author is completely free of bias, Alf Mapp's leanings are unapologetically clear. In most cases, his conclusions are supported by valid but carefully selected snippets of correspondence, journals and speeches. In other instances, his essay on Benjamin Franklin for example, the database is more vague. Brief, but highly informative survey of the religious beliefs of several of our countries founding fathers. The diversity of their religious consciences, social backgrounds and growing belief that freedom from tyranny could be attained through only one avenue led to the war for independence and the creation of some of the greatest governing documents in human history. Highly recommended. The book seems to lose a bit of focus on the role of religion and become a series of biographies. These biographies are quite interesting and of some figures that are not so well-known amongst the general public. If you are looking to deepen your knowledge of these figures it is a worthwhile reader which may cause you to seek out more about their lives or the time period. “The Faiths Of Our Fathers” is written by Alf J. Mapp, Jr. (2003©). Mapp is a colonial historian and this book is somewhat interesting in providing context about the differences in beliefs across the colonies. Other than that, my own belief is that the author is biased towards “Christian” beliefs and caries this bias across in his writing. The book attempts to offer a Catholic (Charles Carroll of Carrollton) and a Jew (Haym Solomon) as secondary evidence that one (an American of historical signi “The Faiths Of Our Fathers” is written by Alf J. Mapp, Jr. (2003©). Mapp is a colonial historian and this book is somewhat interesting in providing context about the differences in beliefs across the colonies. Other than that, my own belief is that the author is biased towards “Christian” beliefs and caries this bias across in his writing. The book attempts to offer a Catholic (Charles Carroll of Carrollton) and a Jew (Haym Solomon) as secondary evidence that one (an American of historical significance) can be deeply religious without being Protestant. In fact, many of the most prominent founders – Washington, Jefferson and Franklin (for example) were Deists – they believed in a supreme being – but did not hold that being MUST be Christian (let alone a trinity). While it is certainly true that most of the founding fathers were raised in a Christian faith, it is NOT accurate to portray them as devout Christians – which is definitely the feeling I was left with after reading this book. For example: Washington did not partake of Communion. When confronted about this and advised that others in the church found his actions “confusing”, Washington stopped attending services altogether. Jefferson rewrote the Bible removing all references to miracles, because he considered them fantasy. And, Franklin was a deist who questioned the divinity of Jesus Christ in his autobiography and in letters to friends. As stated, the book is somewhat interesting as it describes the faiths during the time of the founding of the United States and it is a short book. Other than those two observations, it is difficult to give this book more than a passing recommendation. This is a series of independent essays about the religious or spiritual faith of some of the prominent founding fathers. You could pick up the book and read any of the chapters independently, as they don't have a connected narrative that must be followed consecutively. I'm tempted to criticize, as there were a few chapters that focused very heavily on biographical details that had little to do with the faith of the subject and seemed to be out of place - and yet I just generally really enjoyed re This is a series of independent essays about the religious or spiritual faith of some of the prominent founding fathers. You could pick up the book and read any of the chapters independently, as they don't have a connected narrative that must be followed consecutively. The book had some interesting information about religion in pre-Revolutionary America...and particularly in the lives of several of the Founding Fathers. However, I do not think that the author stayed focused on his topic. Also, the book was not well-edited. Several times, I found the same idea conveyed more than once within the same story. As if the author wrote it in one place and decided to move it to another place and then it was never removed from the original place. There was definitely som The book had some interesting information about religion in pre-Revolutionary America...and particularly in the lives of several of the Founding Fathers. However, I do not think that the author stayed focused on his topic. Also, the book was not well-edited. Several times, I found the same idea conveyed more than once within the same story. As if the author wrote it in one place and decided to move it to another place and then it was never removed from the original place. We seem to be hearing more and more that the Constitution was developed on religious principles and that the drafters wanted religion well embedded in our government. Read this and have the lie put that that thinking. There was a big range of religious practice among the drafters, with some being barely observant. What they had in common was a firm belief in the separation of church and state. While there were some religious references in the Constitution, the intent cannot be in doubt. By the wa We seem to be hearing more and more that the Constitution was developed on religious principles and that the drafters wanted religion well embedded in our government. This is not a book that will radically change your understanding of history, but it does provide much-needed background on a topic that is directly important to how our nation was founded. I also liked that the author included some lesser known Fathers. He also did a wonderful job presenting the religious views of each figure within the boundaries of their personal biographical story. Definitely a good survey on the subject, and a very slim volume for easy reading. So the founding fathers were not all church going extreme right conservatives. SO how should the constitution be interpreted and applied. I side with the view that it must be molded issue by issue into what is called for by the times and the case. That, I believe, is what the founding fathers provided for. This book provided interesting insights into the religious thoughts and pursuits of our founding fathers. Although most did not belong to a specific denomination, they were seekers of truth and I enjoyed reading their writings and feelings. Not a bad read, but don't expect any ground breaking scholarship. Gives a good overview of some Founders' religious beliefs and how the influenced the formation of the republic. Important information about our founding fathers that is never taught. Nice overview of founding fathers from a unique perspective. Not as well written as I would have liked, but interesting. Brief but interesting and authoritative reading about the religious beliefs and influences of the men who founded the United States. A decent, if very basic and sometimes simplistic, look at religion & the founders. The forefathers of our country had beliefs much different from that portrayed by the Republicans and the far right. A good overview of the beliefs of the founding fathers. It needs to be more in depth with better sources as evidence for their belief systems. A solid educational read, well worth picking up if you're in the mood to learn more about this nation's forefathers. I found the book to be a an entertaining read. However, I feel the author strayed from the point of the book often, that being the religious beliefs of the founding fathers. About Alf J. Mapp Jr.
Books by Alf J. Mapp Jr.